If you have a handphone with dual Curved Edge display Screen, such as the Samsung Galaxy series of Note 8, Note 9, S8, S8 Plus, S9, S9 Plus, ... or the Huawei Mate and P series of 9 Pro, 10 Pro, 20 Pro, 30 Pro, ... or some other similar phones, you will need to be more cautious in selecting a screen protector for your handphone. Due to the curve nature of the screen, curved edge tempered glass is a much better choice to fit for the phone than plastic screen protector. Certain curved edge tempered glass only has adhesive at the curved surface, leaving the flat surface of the screen non-sticky. This will greatly reduce the touch screen sensitivity and is a big no-no. It will also cause "rainbow effect" which is a big distraction to screen viewing. Certain tempered glass tends to attract dirt and dust at its edge, which is also a kind of annoyance. Certain tempered glass when applied, would not fit well with the phone casing. 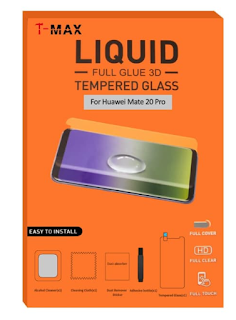 I find the T-Max full glue tempered glass for curved edge display screen handphone, when applied correctly, would not have these common problems and is good to use. This tempered glass is to be applied with adhesive for full coverage on the flat and curve surfaces. The liquid adhesive needs to be dried with UV light. A UV lamp is included in the package. 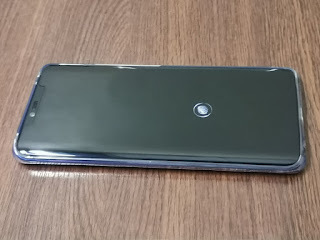 It fits seamlessly on the phone, fits well with the phone casing, has a crystal clear display, does not affect touch sensitivity, and the phone's on screen fingerprint scanner can function well. It also has a layer of smooth oleophobic coating, which will repel water droplets and reduce fingerprint left on the screen.